Though Winter is still hanging on, many Riverview residents have already started preparations for the warmer weather. 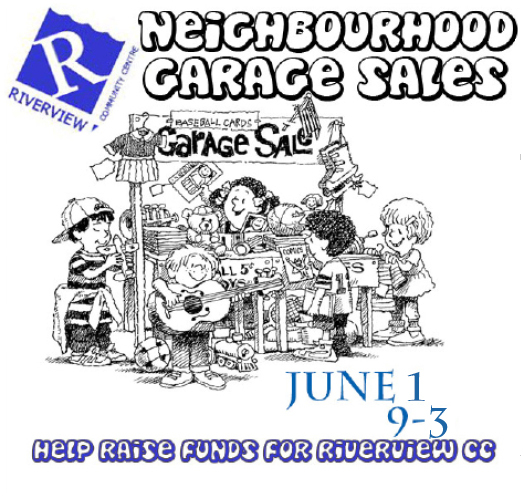 In the process of spring cleaning, please keep in mind the upcoming Riverview Garage Sales if you come across usable items in working order that you no longer want. This could be an opportunity to create more space/ less clutter in your home, as well as way to support our beloved Riverview Community Centre (RVCC). Hold a yard or garage sale at your own home on June 1, and donate 10% of sales to RVCC. We will provide you with a sign and balloons, and do extensive multi-media advertising to bring shoppers to our neighbourhood. Donate saleable goods to RVCC and they will be sold there on June 1 (all proceeds to RVCC). You may drop off sale goods at the community centre to the main floor storage room daily to 8 p.m. Please ask someone there to open the storage room when you arrive. Sorry, but we cannot accept magazines, encyclopedias or text books, TVs, tires, computers, child car seats, mattresses, sofas, or broken items, as these items do not sell at a garage sale. Volunteer to assist at the RVCC sale on June 1 and/or during the week prior, for a few hours of pricing, display, setting up or carrying boxes. No experience necessary. We also require assistance at the end of the sale at 3 p.m. on June 1: people to box up the leftover goods and clean up. Steve Lennon (204) 781-6549, Kathy Larson (204) 452-8509, and Cathy Land (204) 478-0570.